Following a number of fascinating comments made by nFocus’s clients on how vitally important software-testing was to maintaining their professional reputation, nFocus embarked upon a search of articles and white papers to see what other evidence it could find on the subject. A number of articles emerged; none more so than one written by Jack Danahy, CTO of Ounce Labs, entitled, “Your company’s reputation: Critical but fragile” dated 7 April 2009. His article concentrates on a software breach at Heartland Payment Systems back in January 2009 and explores the implications on its reputation following negative media in the press. We found that this article supported our own research and so we have written a brief commentary containing the fundamental take-away points. First, how do you define reputation? And how tangible is it? Jack provides an interesting criterion for judging this whilst investigating the aftermath of the breach three months on. The criterion was a simple Google search that highlighted a great deal of negative media about the company, which most likely will have been read by clients, prospects and employees alike and so caused immeasurable damage to the business. This dramatic security breach highlights the critical - but often underestimated - role that quality software testing plays on the day-to-day running of many businesses. Mistakes can be very costly indeed and can even put the future of some businesses in jeopardy. If you would like to learn more about how high-calibre software testing could help to preserve the reputation of your company (and your own reputation too!) then please call us anytime. You can click here to read Jack’s original article and to learn more about Jack Danahy’s insights into security, visit Jack's bio, suitablesecurity.blogspot.com or http://www.ouncelabs.com/. Agile estimating techniques described by QSTC are based on the Wideband Delphi forecasting method, a refinement of the Delphi method developed by Rand during the cold war to forecast the impact of technology on warfare. Existing scientific laws didn't really work too well but there was a great deal of experience and expert opinions around. The challenge was to aggregate all of this expertise into a single forecast. A bit like trying to estimate how long the testing of software will take I guess (lol). OK how do we do it? You can follow a quite detailed process in the links at the bottom of the page, but let's fast track it. First we need to break down the system under test into manageable chunks; a good start point is to discuss with the developers what the content of the first "build" of the system will contain. For each chunk decide and list what will be tested. Consider the GUI, any hidden client server functions, data bases access (stored procedures/SQL etc), infrastructure, performance checks, stress checks - user and technical (incoming interface overload), and infrastructure checks. Define the major activities for testing e.g. Remember tests have to be designed and written. Data has to be identified and created (why do we always overlook the test data strategy). Tests have to be executed and logged, some tests will be repeated (software does sometimes go wrong). Problems have to be analysed, reported, fixed and retested. This forms the background for the experts at the estimating workshop. If there are estimates that are significantly different (someone votes 1 day when everyone else thinks it is 8 days) then those experts are asked what made them come to that conclusion. After discussion another vote is taken repeat until consensus is reached. Record any assumptions that the team have made when estimating. It is also worth mentioning that I will be presenting a number of software testing sessions for Intellect (London), during October and November 2009, and if you would like further information please click here. 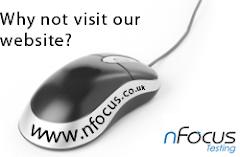 Are you following nFocus_ltd on twitter? Just a short blog entry today to mention that we are using twitter to point out useful articles, websites and so on throughout each day. For more info on this please visit http://twitter.com/nfocus_ltd. It is also worth mentioning that I am currently working on a number of helpful blog articles, so please feel free to check back soon. In the mean time, happy testing.